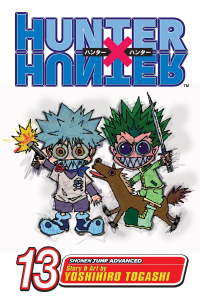 Hunters Gon and Killua have fallen into the clutches of the sinister gang known as the Spiders. Luckily, the Hunters' friend Kurapika has captured the Spiders' ringleader and proposed a hostage exchange. Will the Spiders agree to the plan? Meanwhile, a multi-trillionaire named Battera has been buying up copies of the super-rare video game Greed Island, which may contain clues about Gon's father's whereabouts. More importantly, Battera has been hiring Hunters to play the game for him! Could this be Gon's chance to enter the legendary game?